After creating a chart in Excel 2010, you may need to change the range of the source data that is the basis for the chart. The Select Data Source dialog box enables you to choose a different source range for an existing chart. You also can use this dialog box to switch the row and column values, change the order of the data series used in the chart, and indicate how to deal with hidden and empty cells in the data range being charted. Select the chart and then, on the Chart Tools Design tab, click the Select Data button in the Data group. Excel opens the Select Data Source dialog box. Click and drag in the worksheet to select the new data range. The Select Data Source dialog box collapses so you can easily see your data. You also can use the Collapse/Expand button to the right of the Chart Data Range box to select the range and return to the dialog box. 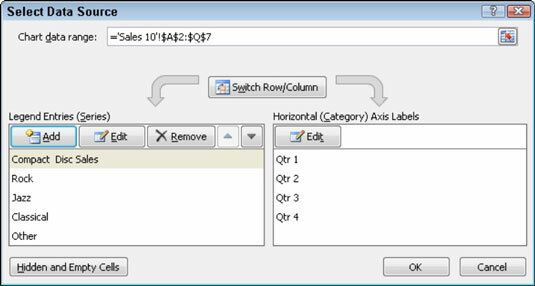 The Select Data Source dialog box reappears and the new data range appears in the Chart Data Range text box. The Select Data Source dialog box closes and the chart updates to display the new data source.